Taking inspiration from the tango orchestras of the Golden Age and infusing it with attitude. 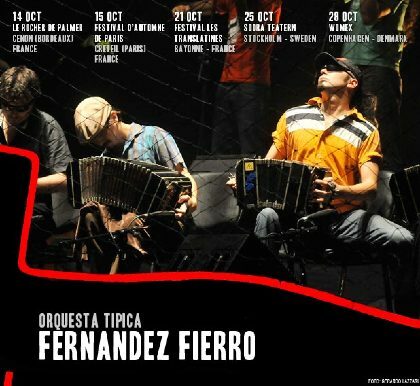 With a typical tango orchestra formation (four bandoneons, three violins, a viola, a violoncello, a double-bass, a piano and a singer) and yet, at the same time, with an original attitude based on a powerful manner of feeling and performing tango, this bold musical machine, the Orquesta Tipica Fernandez Fierro, is organized as a cooperative. 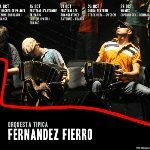 Its repertoire is made up of newly arranged traditional tangos and, most of all, pieces composed by some of its players. Since its creation in 2001 the OTFF has been in charge of editing its own records, managing their own shows and running its own club "Club Atletico Fernandez Fierro" (Fernandez Fierro Athletic Club) in an independent manner. The first CD "Envasado en Origen" was released in 2002, followed by "Destruccion Masiva" (2003) and "Vivo en Europa" (2005), recorded live somewhere near Switzerland. In 2006, the orchestra released their first DVD ("Tango antipanico") and its fourth album, "Mucha Mierda", selected by the renowed argentinian newspaper La Nacion as one of the ten best records released of the year, and its song "Las luces del estadio/Buenos Aires Hora Cero" as one of the 100 best songs released on 2006 by Rolling Stone magazine. The last album, "Putos", was released in 2009. Due to their peculiar arrangements and solid compositions, their easiness, their colourful outfits and their power at scene, these musicians have not only radically renewed the stiff tango scene of Buenos Aires, shaking its traditional foundations and avoiding its commonplaces, but also proved successful abroad during several tours to Europe, Latin-American and USA.